Boog- This is an interesting bias of mine that I wasn't aware of, thanks for bringing it up. I view the term Jewish as referencing the religion that has been chosen by an individual, not the ethnicity/skin color. I've never considered that using the term white could be used to try to marginalize/normalize someone or a group (how's that for white privilege in action). I still think that Bernie is too close to the mold of all of the previous presidents we've had. No problem! I hope my post didn't seem hostile or anything. I'm just seeing a lot of this play out over social media and it is really troubling to see. I don't want to diminish the Jewish minority status, but aren't there some fairly stark differences here? Not at all. I mean, we are seeing hate crimes and anti-Semitic attacks rise across this country. We had a synagogue shot up just a few months ago. We're seeing anti-Semitic language massively proliferate. We have a massive surge of Nazi and white supremacist groups across the nation that campaign HARD on their hate for Jewish people. And then to say Jewish people are just white people is wrong because they sure as hell aren't afforded that privilege historically. It just further divides us and makes it easier to pick apart another group, like the Jewish people, because they get lumped in demographically with people they are not and will never be. I saw a tweet recently about how intersectionalism isn't about intersections of identity but intersections of systems of oppression. That seems relevant to this discussion. Inslee is in, running on climate change as both a threat that must be destroyed and an opportunity to create new jobs. And he doesn't treat staff like sh*t.
Biden responded that he "was making a point in a foreign policy context" at the event, but acknowledged Nixon's point. Okay. He should stay out of the race now. It will only be disruptive and muddy things. Being fangoriously devoured by a gelatinous monster. One thing about older candidates is that life expectancy starts to become a factor. There’s an increasing chance they will die in office (especially if we consider a second term). So best pay attention to the VP candidate as well. To pick on one candidate, as a 77 year old male two terms for Bernie starting in 2021 would slightly exceed his life expectancy of 9.89 years (the forecast average remaining years for a male of his age). A good VP candidate is really important. Even younger candidates for President can have unforeseen accidents and medical issues. I remember back when Obama and McCain were candidates and I didn't really know much about either of them, and it was back in the days when I still believed that the Republican party was still able to produce at least *some* qualified people of intelligence and capability, and I was also pretty excited that McCain had chosen a woman to be his VP. Palin completely ruined any hope that I'd ever vote for McCain even if it turned out I liked him a bit more than Obama. I have such a morbid fascination with that website. I look up people all the time there (Betty White has a 2.5 year life expectancy left). But yeah, I agree about the importance of a good VP pick for both Bernie and Biden. It should be important for Warren too, but thanks to Bernie being in the race she's viewed as the young progressive candidate. I believe it would be a good idea for Bernie and Biden to break tradition and announce their VP choice during the primaries to ensure potential voters that the country will be in good hands if they suddenly croak in office. Ted Cruz announced his VP choice during the primaries, so there is precedent for it. "Who are you?! And how did you get in here?!" "I'm the locksmith. And... I'm the locksmith." Which on the one hand is too bad, I really like him. It's nice to have an Ohio export I'm not ashamed of. But on the other hand I'm glad. The field is full and I'd really prefer D senators in red states focus on staying a senator. There's kind of a Zeno's paradox quality to it. In 2.5 years, her life expectancy will be 2 more years. Life expectancies work like that because of the energy you absorb from your weaker versions in parallel universes. Not one of Jet Li's best movies, but it was OK. It had Jet Li in it though, so that always makes it good! So... the centrist with an appropriated nickname who lost his last election to one of the creepiest losers in modern politics decided to officially declare his candidacy for the 2020 primaries. He came within 3% of defeating a deeply entrenched incumbent in a blood-red state. The closest the last few challengers came was 19%. His campaign saw an unprecedented surge of 3.7 million more voters in Texas than in previous midterms, far outstripping the national average increase for the 2018 elections. He raised $80 million for a Senate campaign, over a quarter of which came from donations under $200. Current polls and betting markets have him as one of the top three candidates in the Democratic field. I'm curious why the hell he WOULDN'T run? As far as I can see, he's got as good a shot as any other candidate. Plus, if he can generate the kind of groundswell support nationally that he did in Texas, 2020 will be a bloodbath for Republicans. I’m not saying he isn’t a strong contender, just that he won’t win the primary, and shouldn’t run. He’s a good candidate for Texas, but ultimately he (and we) would be better off trying to take Cornyn’s seat in 2020 rather than finishing third or fourth behind Harris and Sanders. Against Trump, yes, but against the other Dems I don’t think his charisma can override the fact that he’s a center-left, silver spoon politician with a history of voting against banking regulation, that’s not going to fly in an election cycle where economic inequality is one of the top talking points. This precisely. It's like Joe Manchin were running and everyone was suddenly super excited about his policy ideas. WTF. Obama lost Texas by 16% in 2012. Hillary lost the state by 9% in 2016. If you sense a pattern, you'd be right. 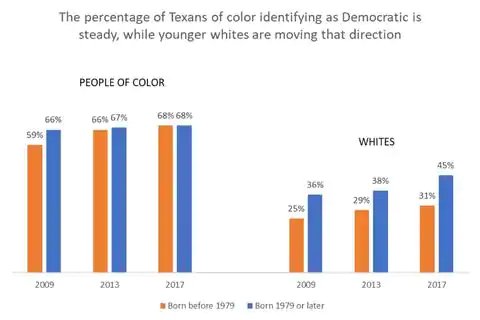 Texas is turning bluer because of its growing non-white population (and that younger whites increasingly identify as Democrats). In 2000, the state was 53% white. In 2017 it was 58% people of color. And Cruz, like Trump, was a highly polarizing candidate that had just about as many people who loved him and hated him and had more people who strongly disapproved of him than approved of him. The 2014 midterms had a turnout of 36.7% nationally. The 2018 midterms had a 50.3% turnout nationally. That's a 13.6% increase. Texas saw an 18% increase in voter turnout in 2018. While that's great, it also had the nation's lowest voter turnout in 2014: 28.3%. And its record midterm turnout still lagged the national average, with only 46.3% of Texans bothering to vote in 2018. A lot of that has to do with demographics--minorities and younger people vote less--and Texas Republicans have done their damnedest to keep them from voting with restricted voter registration, voter ID laws, and proof of residence requirements. And a lot of 2018 was people voting against Trump and Republicans. That's not a slam on Beto, but just recognition that 3.7 million more people in Texas didn't vote because his campaign convinced them to. People were mad and motivated. His Latino popularity is...average for a Democrat. National polls showed that 69% of Latinos voted for Democratic candidates in the 2018 midterms. Overall, Latinos prefer Democratic candidates over Republican candidates two to one and have so for the past decade. Hillary got 66% of Latino votes in 2016. Obama got 67% and 71% in 2008 and 2012 respectively. And Hillary won 80% of Latino voters in Texas in 2016. Because it's already a crowded field and it would behoove the Democratic Party to nominate a candidate who wasn't another white dude. The future of the party--and the country--lies in a different direction. 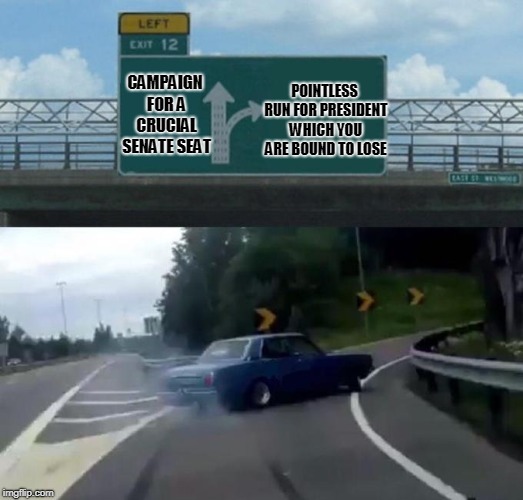 It is not like if Beto is performing poorly that he could just bail on being pres and aim for Senate run #2. However I presume Cornyn does not have the negative image that Cruz has. While I am not saying he is a shoe in, at this point I am not sure you can absolutely rule out Beto being the nominee. And as has been demonstrated since the beginning of time once a person's ego wraps around the idea that should be pres they tend to not let it go. If you wait for tomorrow, tomorrow comes. If you do not wait for tomorrow, tomorrow comes. Now all we're missing is Biden. May the odds be ever in your favor. Beto has no experience. He should do something first. Anyone responding how Trump had no experience either will get f*cking punched in the throat. I mean, he was in congress for six years and in local government for a decade or so. Even if he didn’t accomplish much he has experience. My primary issue with him is that his policies range from mediocre to awful, and the worst part is that he knows it. He’s said during interviews that he’s progressive for Texas but would likely be considered a Republican on the national stage. Keep on eye on how he campaigns this year, unless he’s had a come-to-Jesus moment or is going full-Schultz I guarantee that his campaign is going to be almost entirely aesthetic. He knows that his politics isn’t going to grab a lot of voters in the current climate. Agreed that for him it's the aesthetic. And his aesthetic is old news. People want a hard politics leader that is going to shake up the status quo, not lecture us on how we should all just get along. I don’t think this is something we need in a democratic candidate. I mean, those are contributions from people who work in that industry, not PACs or companies themselves. He ran in Texas, he’s going to end up with a lot of oil and gas industry employees donating to him for the same reason anyone running in NY ends up with a large amount of donations from “Finance”. I have a hope that a really good thing about so many candidates is that it keeps this leaderless movement going. One of the things I've feared is that settling on a single candidate means settling on someone who has to represent the whole movement unleashed by Trump's election. More deomocratic candidates also makes it harder for the republican noise machine to focus all their hatred on a single individual.